Our Worship Team has been meditating on Psalm 27. Do you remember it? Then my head will be exalted above the enemies who surround me; at His sacred tent, I will sacrifice with shouts of joy; I will sing and make music to the Lord. I will see Your goodness. 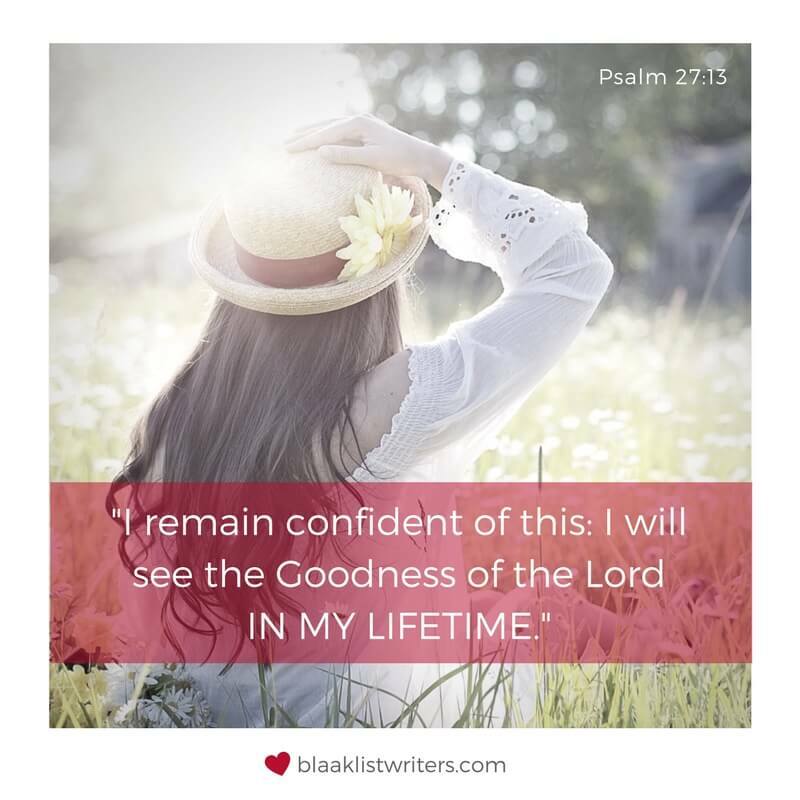 I will see Your goodness, Lord. It cuts right through the fog around my mind—past the urgent, past the worrisome—and brings truth to my dark places. That means here, on this earth, before I get to heaven. We don’t have to wait until we’re dead before we can see His goodness. His provision and favour are here for us TODAY. Here. Now. While we walk this earth. My friends, what do you need? God can provide your every need—healing, comfort, direction, purpose, provision. Even if it looks different than you expect, He is still so eager to step-in and care for His kids. Chew the Word… read it, write it, speak it, sing it, pray it. Not just once, but again and again, and let it wash you (i.e., Ephesians 5:26). Let His Word wash away your doubt and confusion, unbelief and fear. Then let worship rise from the deepest parts of you! Do this and watch the mountains looming in front of you shrink away. Do this and feel your confidence grow. Every Friday, I join an inspiring group of writers to write for FIVE MINUTES on a one-word prompt. No editing. No revising. Just WRITE. This week, the prompt word was PROVIDE. ♥ This image is a free goodie for you! Click to download. Happy Friday! I’m happy to be linked up next to you at FMF. Thanks, Rachel! I’m so glad you came to visit. Heading over to read your post too. Wow! So good. Beautiful redirection…. Thanks, Jess. What a great word… redirection. That’s exactly what happens, isn’t it? Redirected from what we think is real to seeing things through God’s perspective. I’m so glad you came to visit. Have a great week! Wow what PROVISION! Visiting from FMF #26. Thanks, Rebekah! Yes, I’m so grateful that our Father provides everything we need, even if that provision is simply helping us to see life through His eyes. Heading over to read your post too. Have a great week! Shauna, your faith is beautiful and inspiring! As is yours, my friend. It’s always a joy to see your name in my inbox. You’re such a blessing to all who know and love you. Thank you for sharing your life and journey with the FMF community. We continue to pray health, strength, and courage for both you and Barb!